Based on the philosophy of helping humans to relieve of the pain, European Teaching University Faculty of Medicine pursues teaching and research in a way that is necessary for the community, patients and medical sciences. The Faculty has acclaimed international recognition for its continuous investment in human capital, modern medical and information infrastructure and students services. 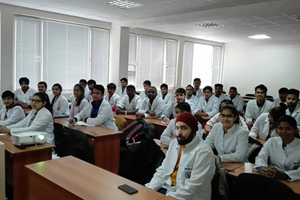 Based on the long traditions of Georgian medical research and teaching, the Faculty of Medicine was founded in 2003 and received full accreditation by the National Centre for Educational Quality Enhancement of Georgia in 2010 European Teaching University has qualified and experienced teachers, specialists educated from leading universities of Europe. So teaching standard is extremely high. The European Teaching University is approved by Medical Council of India (MCI) means Indian students are eligible to study MBBS in ETU. After successful completion of the degree program, MCI screening test is required to practice anywhere in India. European University is member of FAIMER (Foundation for Advancement of International Medical Education and Research). It is also listed in list of medical schools by WHO (World Health Organization). •	Standard of Education is high. •	Located in Tbilisi, the capital city of Georgia. European Teaching University is approved by the Medical Council of India (MCI). Hence, Indian students are eligible to study MBBS in the European University. Students will receive a certificate from MCI. This will allow students to practice anywhere in India. MCI recognises Medical Doctor (MD) degree provided by ETU as equivalent to MBBS in India. The university have hostel on campus. The rooms are shared by 2 - 3 person. Students are not allowed to go out after 8 pm without permission.